Like "All the Bright Places," the #bookstagram community on Instragram pointed me in the direction of this lovely YA novel. Once again, I'm glad I listened. Simon is 16, gay, and not out to his small high school community. But he is out to his electronic pen pal, Blue, another anonymous student at this high school. When someone else from his school gets hold of one of his emails to Blue, Simon gets blackmailed and has to navigate how to come out on top of normal high school drama. Above all, this novel felt real. Simon's conundrum is somewhat of his own making, and also completely awful Yet even though it's dealing with romance and blackmail, the core of the novel remains light. It's a pleasant change of pace from some other, very heavy, YA lit I've read this year. 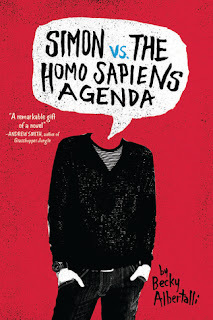 My favorite aspect of the novel, though, was Simon's relationships with his friends. Teenage friendships are tricky to navigate, with the hormones, the jealousy, the fickleness, even among the closest of friends. This novel captured that perfectly, on top of the pitch-perfect does-he-or-doesn't-he-like me we all know and remember from high school. It's a fun romp with a nice bit of emotional resonance. Verdict: Affirmed. It's a solid YA rom-com. 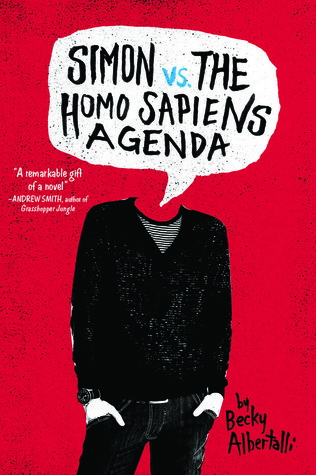 "Simon vs. the Homo Sapiens Agenda" by Becky Albertalli, published April 7, 2015 by Balzer + Bray. Audio narration by Michael Crouch, published April 7, 2015 by HarperAudio.